f/4, 1/250s, ISO 400. This image has been modified. Click here for the RAW file. The only macro lens in the Fujinon GF lineup, the GF 120mm f/4 Macro R LM OIS WR lens offers a 1:2 maximum magnification ratio and was also the first GF lens to feature optical image stabilization (since joined by the GF 250mm f/4 telephoto lens). This weather-resistant mid-telephoto macro lens has been designed to deliver excellent optical quality while providing good usability. Let's take a closer look at the lens and see if it delivers the goods in real-world testing. The GF 120mm Macro lens has a robust, high-quality construction. It feels very solid in hand thanks to its metal construction and nice rubberized focus ring. The lens is weather resistant against dust, moisture and freezing temperatures, and it has a fluorine coating on the front element to repel water and dirt. The lens weighs just over two pounds without the lens hood (980 grams for our metric-using readers), which balances nicely with the GFX 50S body. The focus ring takes up a good portion of the overall lens barrel being roughly 2.5 inches wide (around 65 millimeters). The lens is just under six inches long (152 millimeters), and the lens hood is about 3.5 inches long (roughly 90 millimeters). It's not a compact lens, by any stretch, but it is not oversized relative to the GFX camera itself. While the focus ring feels very nice and rotates well, the GFX is not overly friendly toward manual focus. It can be simultaneously difficult to make precise adjustments yet also very slow to rack focus due to the system's focus-by-wire design. Plus, the GFX's focus peaking isn't all that great. Sometimes it takes a fair bit of patience to get manual focus dialed in. The lens shares its style and build quality with other GF lenses, which is to say that it looks good, feels good and appears to be built to stand up to professional use. The switches feel nice, the rings feel good and the lens has a rugged quality to it. The GF 120mm f/4 lens has 14 elements across 9 groups, including a trio of ED lenses. These ED lenses are positioned to minimize color aberrations -- more on that in a bit -- while ensuring that out-of-focus elements both in front of and behind the subject are rendered in a pleasant way. The lens has nine aperture blades in a rounded diaphragm to assist with nice bokeh as well. f/5.6, 1/500s, ISO 400. This image has been modified. Click here for the RAW file. Looking at the center of the frame, the GF 120mm Macro lens is sharp wide open. You do get a bit more sharpness as you stop down to f/5.6 and f/8, although the difference is negligible. But there's no question that you can capture very sharp images at f/4 with this lens. f/4, 1/1250s, ISO 100. Click here for the RAW file. 100 percent center crop from a RAW image processed in Adobe Camera Raw using default settings. f/5.6, 1/550s, ISO 100. Click here for the RAW file. f/8, 1/320s, ISO 100. Click here for the RAW file. When looking at the extreme corners of the frame, sharpess does not decrease noticeably. The image quality is consistently very good across the entire frame, and the ability of the lens to resolve very fine details from edge to edge is impressive. 100 percent bottom left corner crop from a RAW image processed in Adobe Camera Raw using default settings. The lens displays only minor chromatic aberrations and fringing in particularly challenging scenarios when shooting wide open. The performance is very good overall, though, and the lens does an excellent job at dealing with aberrations. f/8, 1/250s, ISO 200. Click here for the RAW file. 100 percent crop from the above image. You can see a small amount of cyan and magenta fringing on the edge of the white petals. It's minimal and not noticeable in very many situations. Overall, the lens' optical formula is excellent as it delivers not only great sharpness, but reliable color reproduction with only minimal aberrations. There is a moderate amount of light falloff when shooting the GF 120mm Macro lens wide open. However, it is not obvious in many real-world shooting situations and is fairly easily corrected in post-processing. If you're shooting against a solid bright background and don't want vignette, stopping down to f/8 will essentially eliminate the issue while maintaining fantastic sharpness. f/4, 1/125s, ISO 1600. Click here for the RAW file. f/8, 1/60s, ISO 3200. Click here for the RAW file. The GF 120mm f/4 lens does not produce the same dreamy bokeh as the GF 110mm f/2 does, but it produces a nice out-of-focus area with relatively minor cats' eye effects as out of focus spheres move toward the edge of the frame. Bokeh quality is quite subjective, but I find that the GF 120mm does a good job of producing a pleasant background, and it certainly can work for portraiture, even if it isn't as specialized in this respect as the GF 110mm. If a person were choosing between these two lenses given their similar focal lengths, they'd likely be pleased with either. Ultimately, do you value that extra light-gathering capability and shallower depth of field of the 110mm f/2 or the O.I.S. and close focusing distance of the GF 120mm f/4? f/4, 1/125s, ISO 160. Click here for the RAW file. As you can see, the bokeh stays nice and circular in the center of the frame, but it does get a bit misshapen as you work toward the edge, presenting some cats eye effect. f/4, 1/640s, ISO 1000. Click here for the RAW file. While a lens may be able to capture sharp images in a test environment, it can be a whole different ballgame when you take it out in the field. Small issues can become quite large while optical strengths can be downplayed. Fortunately, the GF 120mm f/4 Macro lens performs very well out in the field due to its good handling characteristics, reliable optics, good autofocus and impressive Optical Image Stabilization. With its floating focus system and a pair of linear motors, the GF 120mm delivers pretty quick autofocus relative to other GF lenses. It's not as fast as some of the shorter primes, but it's plenty fast for many situations. Even at close focus distances, focus speeds are pretty good. Of course, it can be challenging to maintain stability at close distances given the very shallow depth of field, and the GF 120mm f/4 lens is not superbly fast with respect to making very minor adjustments. To aid with macro shooting, the lens does offer a limiter switch for focusing distance. You can set the lens to limit focus from 0.45 to 0.9 meters (which is about 1.5 to 3 feet). This helps greatly with speeds as the lens no longer locks focus on something far behind your subject. Another aspect of the focusing system worth pointing out is that it's fairly loud, which could scare away any animals you're photographing, so that's something to keep in mind. It's a small issue and overall, the GF 120mm performs well with respect to focusing compared to other GF lenses. The close focus distance of the lens is 1.48 feet (0.45 meters), which delivers a 1:2 macro image. This means that the lens is not a true 1:1 macro lens, although it does come pretty close, and much closer than any other GF lens at this point. f/11, 0.6s, ISO 100. Click here for the RAW file. The GF 120mm f/4 Macro lens was one of the three lenses to launch alongside the GFX 50S camera. However, at the time, it was only capable of a 1:2 reproduction due to its close focus distance. However, with the new MCEX-45G WR Macro Extension Tube that came out this April, which costs $329 USD, the GF 120mm f/4 lens can be turned into a 1:1 macro lens. The weather-resistant MCEX-45G WR is a 45-millimeter long extension tube which maintains AF and AE functionality while decreasing the minimum focus distance of an attached lens. It also decreases the maximum focus distance, but you typically are using an extension tube specifically for macro photography, so this isn't a big deal. f/11, 1.6s, ISO 100. Click here for the RAW file. Close focus test image with the MCEX-45G WR. In addition to the 45mm extension tube, there is also an 18mm extension tube, which also costs $329. If you'd like, you can stack the two extension tubes together. f/11, 2.6s, ISO 100. Click here for the RAW file. Close focus test image with the MCEX-18G WR. f/11, 2.3s, ISO 100. Click here for the RAW file. Close focus test image with the MCEX-18G WR and MCEX-45G WR. The GF 120mm f/4 lens was the first OIS-equipped GF lens when it launched alongside the camera. Much like other Fujifilm OIS lenses, you can sometimes hear a rattle when the attached camera is powered off. This is a small annoyance and is more than made up for by the great OIS performance. The lens is rated for five stops of correction and it certainly appeared to do a good job. See above for shooting information. Click here for the OIS ON RAW file. f/4, 1/250s, ISO 640. Click here for the RAW file. f/4, 1/500s, ISO 800. This image has been modified. Click here for the RAW file. 100 percent crop from the above modified image. f/6.4, 1/4s, ISO 100. Click here for the RAW file. f/4, 1/13s, ISO 100. This image has been modified. Click here for the RAW file. f/11, 2.3s, ISO 100. This image has been modified. Click here for the RAW file. f/4, 1/500s, ISO 500. This image has been modified. Click here for the RAW file. 100 percent crop from the modified image above. f/4, 1/320s, ISO 3200. Click here for the RAW file. f/4, 1/640s, ISO 640. This image has been cropped. Click here for the RAW file. Alongside the MCEX-45G extension tube, the GF 120mm f/4 Macro lens becomes a true 1:1 macro lens and a very good prime lens. Of course, this adds to the cost. You're looking at spending around $3,000 USD for the combination of the lens and tube, which is a significant amount of cash. For that money, however, you get a great lens that delivers superb sharpness. Even if you don't need macro capabilities, the GF 120mm f/4 Macro lens offers a lot due to its build quality, good autofocus performance and excellent optical performance. (From Fujifilm lens literature) The FUJINON GF120mmF4 R LM OIS WR Macro is a mid-telephoto macro lens specifically designed for the new G Mount and 43.8 x 32.9mm sensor. The GF lens range, which can cope with resolutions up to 100MP, combines the latest technologies with extensive knowledge accumulated from making XF lenses to deliver the best possible image quality and realize the full potential of the new GFX 50S medium format mirrorless camera. The intuitive controls include a C position on the aperture ring, which allows you to adjust the aperture value with the command dial on the camera body. The A (Auto) and C positions are now lockable and all the lenses are weather and dust resistant, plus they can work in temperatures as low as -10°C for worry-free shooting outdoors. Brass mount has been adopted for the strength. This new lens series is set to become a professional workhorse. A 5.0-stop* image stabilizer inspires confidence when shooting hand held. The lens features nine weather resistant seals so you can shoot outdoors in wet, cold or dusty conditions. A fluorine coating is also applied to the front lens element to repel water and dirt, further improving the toughness of the lens. 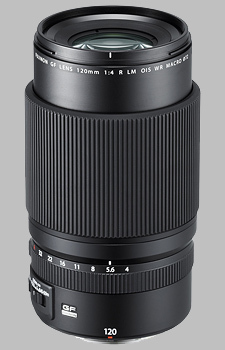 The Fujinon GF 120mm f/4 R LM OIS WR Macro doesn't have any user reviews yet!